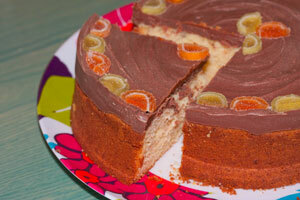 A lemon flavoured madeira type cake topped with a thick layer of chocolate. It is also often finished with marzipan fruits. Cream together the butter and sugar until light smooth and pale. Add the eggs, flour, lemon juice, lemon rind and ground almonds, mixing thoroughly. Place the mixture into a 20cm(8inch) greased and floured tin. Bake at 300°F (150°C) for one hour or until springy in the middle when pressed. Slice off the very top of the cake to form a flat surface. Wrap some greaseproof paper around the sides of the cake, standing proud of the top, secure with a peice of string of small peice of selotape. Pour the melted chocolate mixture into well created by the greaseproof paper. This should form just over one centimetre of chocolate. Optional: Place marzipan fruits or decoration of choice on top to finish.